YOU NEVER KNOW WHAT YOU'RE GOING TO FIND! I SPOKE TO STEVE, JIGGLING A BOX OF CHOCOLATES. OH, LIFE IS SO FULL OF MYSTERIES! I LIKES TO SOLVE MYSTERIES. I HAVE A FEELS IN MY BELLY THAT I HAVS SOLVED MANY MYSTERIES OF LIEF, THE UNIVERSE AND EVERYTHING ELSE IN THE PAST! FOR EXAMPLE, JUST LAST WEEK I HAVES SOLVED THE MYSTERY OF SNIPPEY’S BUTTON AND SINCE THEN I HAVE RID CAPTANIA OF TWENTY SEVEN HUNDRED AND TWELVE ITEMS OF DANGER-NESS VIA PROCESS OF SHATTERAGE! OH, YOU’D LIKE TO HEAR THE STORY OF SNIPPEY’S BUTTON, STEVE? SNIPPY WAS NOT AWARES THAT HIS JACKET’S BUTTON COULD BE ACTIVATED UNTIL I HAD POKED AT IT. HE WAS MOST SURPRISED WHEN HIS BUTTON STARTED TO TICK AT RANDOM INTERVALS AND RANDOM PLACES. “My jacket had an in-built geiger counter all this time? !” HE DECLARATED IN SURPRIZE-NESS. “THIS BUTTON DOES NOT DETECT NOR COUNT GIGERS!” I STERNLY EDUCATED SNIPPS. “It sure sounds like a geiger counter.” HE DISAGREED, LISTENING TO THE BUTTON’S SOUNDS OF TICK-NESS. ATTENTION : TOUR GUIDE / TOURIST! THE E.D.S.A. INDICATOR WILL WARN YOU (VIA AN AUDIBLE TICK) OF A SYSTEM’S/APP’S PRESENCE THAT IS OF POTENTIAL DANGER TO YOU (ORGANIC USER) DUE TO SPACE, TEMPORAL OR INTELLIGENCE/SENTIENCE EXPLOSION (TECHNOLOGICAL SINGULARITY) WITHIN THE SELECT APPLICATION. PAY ATTENTION TO THE INDICATOR AND TAKE EXTREME CAUTION IN APPROACHING A SYSTEM OR AN APPLICATION WITH A HIGH/DANGEROUS/CORRUPT INTELLIGENCE CURVE. TLDR: HAVING A RELATIONSHIP WITH AN INTELLIGENCE THAT DOES NOT MATCH YOUR OWN IS INADVISABLE. “YOUR BUTTON JUDGES THE GEEKY-NESS OF ALL THE THINGS!” I TOLD SNIPS, TEARING THE BUTTON OFF HIS JACKET. “Hey! Give that back! Come back here! That’s my button!” SNIPPS WHINED LIKE AN IMPUDENT LITTLE GIRL WHO DID NOT WANT TO SHARE HER PINK RIBBONS WITH FRIENDS. “FOLLOW ME, I SHOWS YOU HOW IT WORKS!” I SLAPPED SNIPPY AWAY, AS I PRANCED INTO A NEARBY HOTEL. THE BUTTON TICKED IN ME CLAW AS I WAVED IT ACROSS MANY DOORS OF THE HOTEL’S CORRIDOR. AT DOOR #178 , IT STARTED TO TICK EXTRA FURIOUSLY. I NINJA-KICKED THE DOOR OPEN. LISTENING TO THE TICKING INTERVALS OF BUTTON, I WAVED IT ACROSS THE ROOM, UNTIL THE BUTTON’S JUDGEMENT HAD SETTLED ON A MIRROR. “Stop! Come back!” SNIPPER VIOLENTLY WAVED HIS FLAPS FROM THE DOOR. I WALTZED TOWARDS THE MIRROR. SNIPPY SCREAMED SOMETHING INCOHERENT FROM BEHIND, TOO SCARED TO ENTER INTO THE ROOM (PROBABLY DUE TO SCARY-NESS OF THEM GIGERS). THE BUTTON’S TICKS CONVERGED INTO A SYMPHONY OF UNWHOLESOME SCREECHING. “SEE, THERE BE NOT GIGERS IN THIS MIRROR, BUT EXTREME SMARTS!” I PLACATED SNIPPY, GLANCING INTO THE MIRROR AS I WALKED INTO ITS ACTIVATION RADIUS. THIS WAS MY MISTAKE. THE SMART MIRROR TURNED ON, BATHING ME IN FRACTAL RAINBOWS. I shook my head, trying to make sense of what had just transpired. I shivered, feeling a deep chill within all of me organs. Something was amiss, askew. The world had faded, turned gray, sapped of all its pretty colors. The only colors I could see were now behind the mirror. I saw myself in the mirror, waving Snippy’s shiny Evaluator Button at it, with Snippey frozen in the doorway. As I moved about, my reflection did not. I suddenly noticed that my head was filled with dreary silence, as if all the angry and merry voices and visuals of the world were cut away. My left arm felt like my right arm. My right eye felt like my left. The room itself was inverted! The mirror must have put me into the reflection world, I grimly realised. The mirrored Evaluator Button crumbled in my fingers, like an over-baked cookie. “You! Smart-Mirror! You did this!” I crabbed towards the mirror in anger. The mirror refused to be of cooperation. “You should be nicer to mirrors.” A chill, whisper voice came from behind me. I turned. It was reflection-world-Snippy. I pondered tearing off his mask to see whether he had an evil goatee underneath. Mirror-Snippy flickered. The Smart-Mirror was now in his hands. The Mirror-Snippy was not a snail at all! He moved with frightful speed, unlike the bumbling real Snippy. “Hey! That’s my Smart-Mirror! Gives it backs!” I shouted. 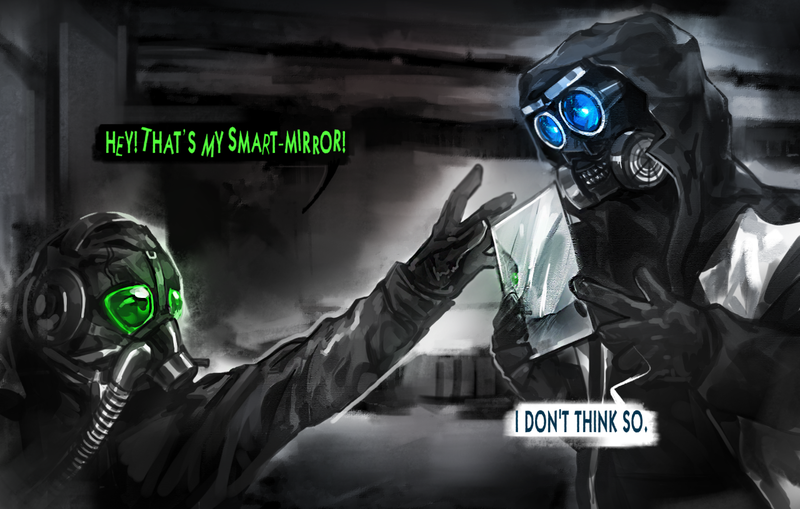 “I don’t think so.” Mirror-Snippy stepped back, his mask twisting into a creepy, teethy smile. The window back into the real-world glinted with vibrant colors in his arms, as he dissolved into the hallway. There was no persistent charts in me eye to tell me what to do or where to go. There was no friends everywhere to greet me. The deafening silence of the grayscaled Mirror-Universe was overbearingly crushing. I pondered whether Snippy felt like this in the real-world, always terrified, abandoned and forever-alone. “I learned my lesson! I will be nicer to mirrors! I want to go home! Please come back, Mirror-Snippy!” I slushed into the hallway. My leg noodles felt heavy, as if I was plowing through a thick jam. Particles of dust trailed behind me. It was not dust, I realised. It was me atoms! As I moved through the Mirror-Verse, I slowly thinned myself down, wore myself out. How long could I last in the Mirror-Verse? How many more steps can I make, before I sand myself down to nothing? There were many doors, so many rooms in the Mirror-Verse hotel. There must be other mirrors within! Could one of them take me home? I shattered the nearest door, losing about one twentieth of myself in the process. Pieces of the broken door floated in the air, cutting gashes in my body, as I passed them. I reached the jacket-closet mirror and looked into it. The mirror was black, it showed me nothing-ness. No, it wasn’t nothing-ness… it was space, vast, empty space, the darkness between the stars. The void stared back at me, called to me, tried to draw me in, but I resisted, pulling away. “You are not my home Mr Void!” I said to it, lumbering towards the bedroom mirror. The bedroom mirror showed me the ancient past. An ocean that long-long ago covered the planet, filled with trilobites and giant amoebas. Not desiring to be a trilobite’s dinner, I moved towards the bathroom. The bathroom mirror smelled of gunpowder and treason. War of long-dead men raged within. Napoleon stood proud and commanded his legions to plow through his enemies. Cannons rolled through the mud. “Don’t do it, Mr Napoleon. Russia is not worth it.” I commented. Napoleon chose to ignore my voice of truth and reasonability. He had grand plans and grand dreams. I rummaged through the bathroom drawers, pulling out a small, hand-held shaving mirror. My fingers were beginning to look thin and skeletal. The shaving mirror was non-compliant. It showed me the end of all the things, death of galaxies, dimming of stars and collapse of the Universe into a mega-black hole. I threw the shaving mirror aside. I did not want to see how all stories end. Such spoilers did not provide me pleasures. I broke into other rooms. The Mirrors within showed me various epochs, an array of strange and foreign places. They showed me fantastic dreams and horrible nightmares. I saw futuristic utopias, gridlocked with floating spheroids, cuboids and tetrahedrons of various size. I saw creatures made of infinite tentacles from worlds of non-euclidean geometry that promised me endless suffering. I saw two-dee worlds and six-dee ones. None of them were my home! There were mirrors that showed the best discounts in the Universe. Mirrors that showed the most-extreme of weathers. Mirrors that explained the feelings of vegetables. Mirrors that displayed places too abstract for my mind to wrap around the concepts within. Mirrors that broadcasted the most interesting of TV-shows. Mirrors with the dullest and most boring of views. Mirrors filled with cute bundles of cats with fields made of tiny kittens. Mirrors with public and private things. Hallways and hallways of endless rooms. Mirrors within mirrors. Infinite views of infinite worlds. How could I ever find my reflection within? I collapsed in the hallway, as my toothpick-thin legs snapped and shattered. Mirror-Snippy formed over me, coalescing out of a spooky smoke-cloud. He stared at my misery. “I gave you so many routes, so many paths, so many different worlds, so many places in space and time. Why did you not choose any of them? Why do you persevere to find your former place?” He chattered. “Is this what you reeeeeaally desire?” Mirror-Snippy leaned in, surprised at my persistence. “So be it.” He spoke, just as what had remained of my body turned to dust. I STEPPED BACK FROM THE SMART-MIRROR. SOUNDS AND COLORS FLOODED MY SENSES. SNIPPY YAMMERED ABOUT RADIATION FROM BEHIND. IT SEEMS THAT NO TIME HAS PASSED AT ALL BETWEEN THEN AND NOWS! I PICKED UP A GRIMY, TORN UP CHAIR FROM THE SOGGY FLOOR-CARPET. “NO-ONE SHOULD BE FORCED OUT OF THEIR PLACE AND TIME!” I SHOUTED, THROWING THE CHAIR AT THE MIRROR. THE MIRROR SHATTERED WITH A SCREAM. “NO-ONE SHOULD EVER FEEL ALONE IN THE INFINITE WORLD OF CHOICES! NO-ONE SHOULD EVER BE FORCED GO ON A SPOOKY ADVENTURE WITHOUT THEIR PERMISSION!” I YELLED AT THE PIECES OF THE BROKEN SMART-MIRROR. AS I WALKED BACK INTO THE HALLWAY, I HANDED THE SMARTS-DETECTOR. SNIPPY NODDED, ACCEPTING THE GIFT OF EVALUATOR-BUTTON. I PICKED UP THE NOW HARM-LESS PIECE OF A BROKEN MIRROR OFF THE GRIMY FLOWER-CARPET. IT WAS MOST POINTY. "WITH ITS SMARTS GONE IT CAN NOW SERVE AS AN EXCELLENT CAKE CUTTING TOOL!" I STUFFED THE PIECE OF THE MIRROR INTO SNIPPY'S COAT. HE PROTESTED MY GIFT ONLY MILDLY, KNOWING THAT A PARTY IS INEVITABLE AND HE STILL DID NOT ACQUIRE THE SHINIEST SPATULA IN THE UNIVERSE PER CAPTAIN'S ORDERS. WHAT IF ALL MIRRORS EVENTUALLY EVOLVE TO BE OF SMARTS? WHAT IF SOMEONE LIKE SNIPPEY, SOMEONE WITHOUT PERSISTENCE OR PURPOSE, WITHOUT AN ANCHOR... WILL FALL INTO THE MIRROR-WORLD? I HAD TO DESTROY ALL OF THE MIRRORS IN THIS HOTEL, IN THE LAND OF CAPTANIA, ON THIS PLANET, IN THIS STORY! Is Pilot's personality influenced by his organic self? Because whenever he's disconnected from his neural interface, that's when he is at his craziest. It's only when he is connected to annet when he is all "cool" and stoic. Or is his personality a direct result of him malfunctioning? I'm pretty sure that a dex's personality is already influenced by their original personality, so I'm leaning more towards his zaniness being because of his malfunctioning, because otherwise his personality would probably be reflected in his pre-pineapple days. I guess it makes more sense that he's been "reset" and is therefore a literal man child. It's just that it would be kinda nice to know that pilot's original personality was the same pilot we know and love. Someone commented on another page "Pilot has no idea what happened, but he knows what's going on." It was in reference to a future event that I won't spoil here for first-time readers but it seems to be fitting with Pilot's character all the time. This event sure looks like a test of faith for Pilot, and looks like he passed with flying colors. I can't help but be reminded of the Mirror of Erised from the Harry Potter universe, sort of subverted with an "evil mirror universe" trope. Pilot describes Snippy as "a snail." I assume because he is a DEX and processes everything so much faster than a human. Captain tells Pilot that anything can happen if he truly believes it. (Not an exact quote, can't find it in my notes.). Seems to be working! Also foreshadowing the Wizard of Oz bit. Pilot is surprisingly kind to Snippy after his ordeal, giving him back the useful button and a weapon. Pilot was disconnected from ANNET for the duration. I daresay this is the first we've seen of Pilot's un-augmented, true personality. @Whammytap yup, he's just said #### you to the 4th wall... Time for some reader-character interactions! Anyone notice how he doesn't type in all caps in mirror land? The mirror shard Pilot gave Snippy saved his life now. Was I the only one who read some of Pilot's lines like a pirate? Lines like "STARED AT SNIPPY'S BUTTONS WITH ME RIGHT EYE", and "THERE BE NOT GIGERS IN THIS MIRROR"
@Griff The first thing that comes to my mind is a shard glass or mirror.